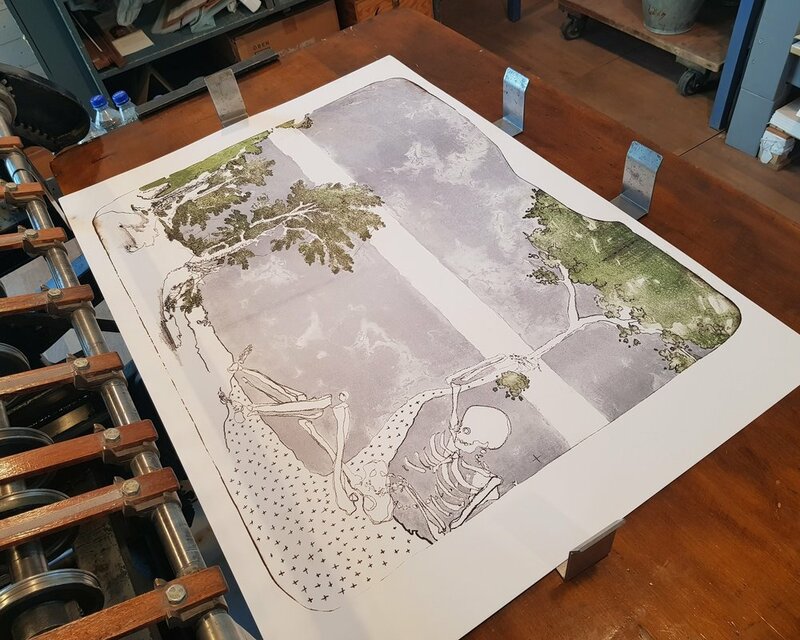 Earlier this year, in February, Patrick Wagner of Black Heart Press and master printer Ernst Hanke met at the Litografiska Museet (The Lithographic Museum) in Huddinge, Sweden to collaborate on a series of prints using Patrick’s new DIY drawing robot, or "polargraph." While stone lithography is usually viewed as an old-fashioned printing method, Patrick and Ernst’s collaboration was anything but. 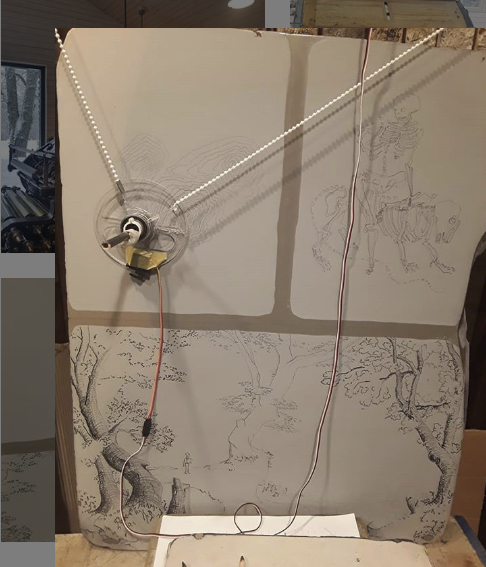 Wagner’s images were drawn onto the stone using a polargraph, a wall-mounted plotter that transfers digital drawings onto physical surfaces using Arduino open source code and a pulley system. The polargraph, designed by Sandy Noble, is wonderful for artists because you can load it with whatever pen you please. Patrick is also attracted by its ability to bridge the gap between digital source materials and analog output. This drawing system was particularly interesting to Ernst, who has been experimenting with plotters since the 1990s, when the rigid, horizontally mounted plotters were used in architects’ offices. Back then the technology was prohibitively expensive and architects were not keen to have Ernst fill and possibly clog the plotter head with greasy tusche. That’s not a problem now with Sandy’s polargraph. The drawing robot has escaped the architect’s office and run into the artist’s studio. Patrick and Ernst began with digital files created by hand-drawn images, using a Wacom tablet and appropriated digital images. The polargraph is set up with the stone placed vertically, one of the benefits of the polargraph because lithography stones are too thick and heavy for horizontal drawing machines. They added color layers to the print by hand-drawing back into the stone. Watch Patrick’s video to see the whole process from digital file to final print. The first drawing material they tried was an oil-based pen, which they discovered worked best when the ink was fresh. 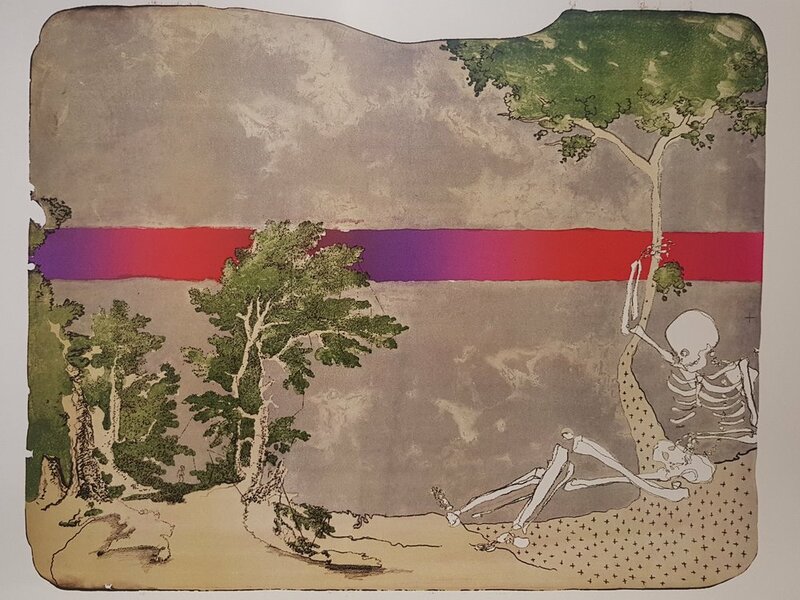 The skeleton they drew the evening before printed well, as the fresh ink resisted the etch used to set the image into the stone. But they struggled with printing the trees, which were drawn a week before. It's also possible that the ink’s resistance was compromised as the pen was at the end of its life span. Another drawing that worked well for them was a #2 lithographic crayon. When the point got too dull, Patrick used the "pause" function to change out the pencils. The crayon drawing printed without any surprises even though it was applied earlier in the week. 3. Want to Learn More? Watch the whole process from digital file to final print. To learn more about Sandy Noble’s Polargraph visit his website at www.polargraph.co.uk. There you will find all the open source materials and code along with the kit and instructions to build your very own polargraph. Another Polargraph ambassador is artist Christian Bazant-Hegemark, www.bazant-hegemark.com and @christianbazanthegemark.